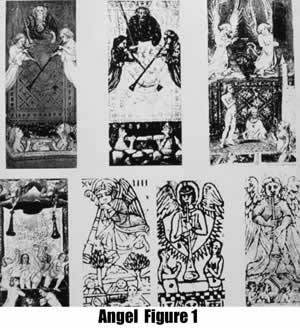 Figure 1 shows the Angel cards that have survived from the 15/16th centuries. The imagery is remarkably consistent across the cards, showing one or two angels blowing trumpets and figures rising from graves. Two of the cards show a crowned and bearded figure with a sword. 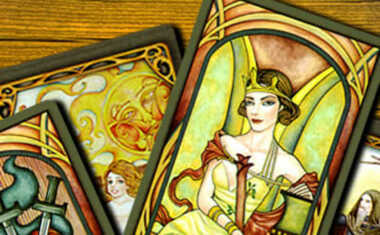 There seems little doubt that the imagery of the early Tarot cards represents the Last Judgment. Belief in the resurrection of the body and final judgment are Christian tenets dating back to the second century (McGinn 2000b). The concept is clearly stated in I Corinthians 15:52 "...when the last trumpet sounds...the dead will be raised...". Bynum (1995) traces the doctrine in great detail through the 4th century, the middle ages and into the 14th century and makes clear that this is actually the physical body being reconstituted and reunited with the soul at the end of time. 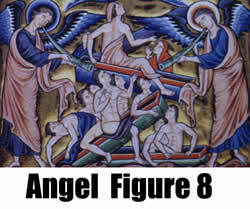 Representations of the last judgment survive from as early as the 7th century (Klein 1992). The images were based on Matthew 25 and Revelations 20:13-14 "The sea gave up all the dead who were in it; Death and Hades were emptied of the dead that were in them; and every one was judged according to the way in which he had lived." As early as 680, Bishop Agilbert had his funeral chapel decorated with a panel showing the resurrection of the just on the last day (Aries 1974). Shrimplin (2000) provides an extended discussion of the many biblical references to the bodily resurrection and final judgment. 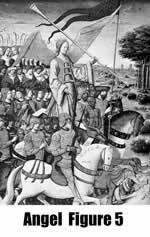 Figure 2 shows a common representation of this image from 1495 Florence. The figure shows the two angels, trumpets, rising figures and Christ as the central figure. The image clearly shows the same symbolism as the early Tarots. Figure 3 shows a closely related image of the resurrection from a Psalter ~1413. Images with a single angel and rising figures are also common. For example, Fig. 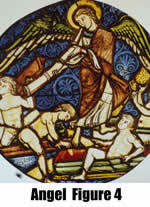 4 shows a stained glass window ~1200. Similar images can be found in an 11th century Greek gospel (Bynum1995, plate 7), as a manuscript illustration from the late 12th century (Bynum 1995, plate 2), as a bas-relief on an early 13th century cathedral (Boase 1972, fig. 25), and in a 13th century Psalter (Bynum 1995, plate 18). The number of representations of the resurrection and judgment scene are in the hundreds. 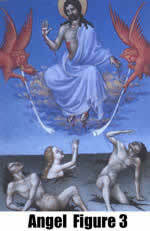 The usual image shows two or more angels blowing trumpets with bodies rising from the ground. Examples date back at least to ~1070 (Grubb 1997, p. 82) and include a Verdun altarpiece ~1200 (Grubb 1997, Frontispiece), the central portal of Notre Dame ~1210 (Grubb 1997, p 81), a 13th century fresco (Grubb 1997, p. 128), Pisa ~1330 (Paoletti and Radke 1997, fig. 3.24), Florence ~1355 (Meiss 1951, Plate 90), a Gospel illustration ~1466 (Williams 1994, p. 125), an altarpiece 1399-1464 (Anonymous 1999, p. 54), a manuscript ~1485 (Voelkle 1998, p. 71). 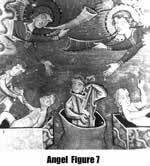 Images of the bodies rising from the grave can also be found as bas reliefs over the portals of 12th and 13th century cathedrals (Bynum 1995, plates 27 and 33). "...It is, as I imagine, very near at hand. And when it comes, men shall understand how evil have they spent their time...And then the mighty celestial king, impartial in his judgment..."
So the expectation of the imminent end of time and the Final Judgment is, in fact, presentin Petrarch's poem as it is in most of the culture of the times. However, the wording of the poem does not justify the imagery of the angel, trumpet and bodies rising from the grave. The typical imagery of the final resurrection and judgment does not appear in the artistic tradition based on Petrarch's poem. However, one occasionally finds an image of the Triumph of Fame with an angel and trumpet atop the chariot (Carnicelli 1971). An example is given in Fig. 5 (16th century) but the figure appears on a chariot pulled by 4 elephants and there are no hints of rising bodies or graves. There is only the image of death as captive on the front of the chariot. By the 11th century illustrations of the last judgment had become thoroughly integrated into the Apocalyptic artistic tradition. 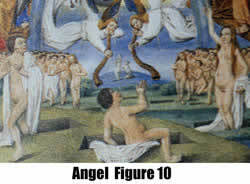 Characteristically, the older images of the Last Judgment are integrated with imagery derived from visions recorded in Revelations (Male 1949). The integration (or perhaps assimilation is a better term) is not surprising given the growing concern with the "last things", reinforced by wording in Revelations itself. For example, Revelations 11:18: "...now the time has come for your own anger, and for the dead to be judged, and for your servants... to be rewarded." Also, Revelations 14:7 "...the time has come for him to sit in judgment..." and Revelations 20:4-6 " I saw the souls of all who had been beheaded for having witnessed for Jesus...and those who refused to worship the beast...they came to life and reigned with Christ for a thousand years." Figure 6 shows a woodcut illustration from an Apocalypse of c. 1430-1440 that shows the two angels blowing trumpets and heads only arising from the sea. Notice also the Sun image in the sky above. A similar image, without the text inserted, is seen in a 13th century illustration (Fig. 7). A more complex image was painted by Fra Angelico in 1431 (Grubb 1997, p. 86) and another can be found in the Orvieto Cathedral (~1500) with two angels, trumpets with banners and crosses, and bodies rising naked from the grave. The imagery is common in book illustrations (Fig. 8, 13th century) and can be found in painted initial letters in prayer books (Fig. 9), in psalter illustrations (Fig. 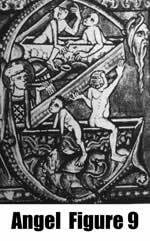 10, late 15th century), in illustrated manuscripts of the Apocalypse (Fig. 11, 13th century) and even in unusual venues such as a 15th vessel designed to hold a relic (Fig. 12). 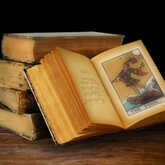 It is very clear that the early Tarot cards are representations of the Last Judgment. We have found an abundance of examples from a variety of venues and in many forms accessible to the card-player. It can also be argued that the card-player would have recognized the sequence of images, starting at the Devil as a meaningful series related to the Apocalypse. In many illustrations of the resurrection of the body, the Moon and Sun appear together in the sky (e.g., Bynum 1995, plates 1 and 8). The Devil, Moon, Sun, Angels and rising dead appear in the magnificent (1306) Giotto fresco in the Arena Chapel in Padua (Grubb 1997, p. 79). By 1498, Durer is representing the falling Star, Moon, Sun and Angels blowing trumpets in his imagery of the Apocalypse (van der Meer 1978, Fig 192). The sequence of images had become a traditional representation of the resurrection of the dead and the last judgment. 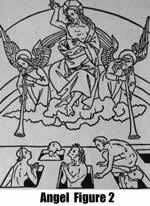 There is little doubt that the card-players recognized the Last Judgment in the 15/16th century cards. The citizens of the northern Italian city states were inundated with this iconology and it formed a common theme of sermons. Tales of otherworldly journeys and illustrations of the end times were almost universal by the beginning of the 15th century and popular (Gurevich 1988). The only real question that needs to be answered is how the card-player would have responded to the imagery. McGinn (2000b) provides an insightful answer: mixed hope and fear. The first part of the reaction is hope because no matter how oppressive and unjust the present life seems there will come, at the end of time, a final reckoning. Black Death, powerlessness, and poverty only make sense, and can only be borne, if there is an ultimate justice that will rectify the imbalances. The second part of the reaction is fear because the ultimate reward and justification is only offered to those who die in the state of grace. The ultimate justice is only available to those who are themselves just. Thus, guilt and the realization of one's own sinfulness cause one to fear the end times as bringing judgment on oneself.